This Favorite Spot in Front of Our Window Guarding the house. 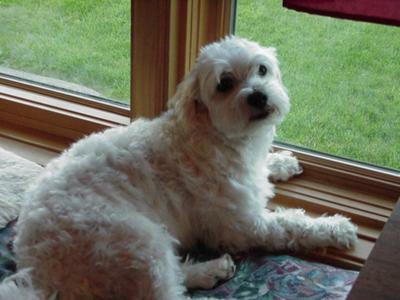 When we got him from the Animal Shelter they told us he was Maltese - Poodle - but I think he's a Coton de Tulear. How can you really tell? He's between 4-5 years young and a REAL TREAT. He has shorter legs in front than rear, he loves to climb on everything including our dining room table and he loves to sleep on his back stretched out. When we return from a short trip - he jumps on his hind legs and thinks we've been gone days instead of a half hour. His tail is like a maltese - but his frame isn't like a poodle or maltese; we had a toy poodle too, along with our Lhaso. Is there any test we can give him to determine if he is really a Coton? Thank you for any help you can give me. In Michigan I don't believe most vets know about them. We know that whatever JR is - and I believe he's a Cotton - he's a wonderful, great tempered dog. He loves our Grandchildren and of course US. He's protective of our almost 17 year old girl since his brother Little Boy the Maltese isn't happy with her. (we received Little Boy from a dear friend) but JR is certainly a blessing for our family. Little Boy has papers saying Maltese, but everyone that sees them together think their brothers. I know JR isn't Maltese - he's too big and broader than Little Boy. Of course we love them all. THANK EVERYONG FOR THEIR COMMENTS. I was told my rescue was a coton mix, and submitted the mixed breed dna test just for fun, it came back as 100% rat terrier x 3 generations. I already knew the test did not cover Coton but I thought it might get something close like havanese or tibetan terrier. My Jake is the cutest little guy, I'll post a photo and see what y'all think he might be. I guarantee he is NOT 100% rat terrier!! That face certainly looks like n expression of my Coton Tuffy. What a cute dog! This could be tricky since the Coton de Tulear is still pretty rare. I've researched some of the online breed identification web sites but they STILL don't recognize the Coton breed. Today there are DNA tests available to determine a dog's heritage. Unfortunately, the DNA kits that are easily available only screen for about 30 to 60 different breeds and currently the Coton de Tulear is NOT one of them.